A delegation of five Filipino congressmen landed on a disputed island in the Spratly chain on Wednesday in a melodramatic assertion of the Philippine claim to what it calls “Pagasa” island, despite warnings from China that the trip would destabilize the region and harm relations between Beijing and Manila. He spoke to about 80 Filipinos who live on Thitu, which covers in area of about seven hectares and lies about 450 kilometers northwest of Palawan. His audience included 60 Filipino residents, as well as soldiers, police, Coast Guard personnel and government employees. Who authorized congressmen to proclaim or reiterate Philippine sovereignty on behalf of the government is a matter of conjecture, but it is clear the congressmen visited the Spratlys on their own initiative. While no one can stop them from playing patriots, in the Philippine constitutional scheme of things, it is fairly established that foreign policy initiatives and their implementation come from the executive department, not from the legislative department. Whether or not the congressmen cleared their visit to the Spratlys with President Aquino or whether the administration was informed about it beforehand is subject to speculation, but the government is washing its hands regarding the trip. What’s undeniable is that the trip dragged the government into an issue with China. On China’s objection to the visit, Presidential Spokesperson Edwin Lacierda made an ambiguous statement. He invoked the provision on a 200-nautical mile exclusive economic zone under the United Nations Convention on the Law of the Sea. 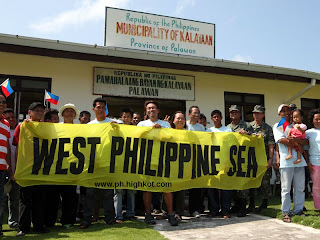 “This was a move on the part of the legislators, on their own initiative, to go and visit the Spratlys,” he said. Philippine officials tried to explain to Chinese Embassy officials that under the Philippine constitutional system, Congress is co-equal with the executive department, hence congressmen were free to decide to visit and to see for themselves conditions in those territories claimed by the Philippines. This explanation may not be of much help to the Chinese whose system has a highly centralized structure in policy decision-making. Over the past few months, there have been a series of incidents involving encounters between Chinese patrols and Philippine vessels conducting explorations for oil and minerals in the areas claimed by Manila. Manila has accused Chinese forces of opening fire on Filipino fishermen in the areas claimed by the Philippines as well as putting up structures in disputed areas apparently as a prelude to the construction of more permanent structures. The congressmen’s visit took place as officials of the Association of Southeast Asian Nations were meeting in Bali, Indonesia, to find diplomatic solutions to the territorial disputes in the South China Sea, which had generated fears that these would escalate into armed conflict. The maritime dispute has dominated the agenda of the five-day Asean meeting. Senior Asean officials have agreed on “guidelines for cooperation” in the South China Sea. But diplomats said the agreement was watered down in the search for a compromise. While the guidelines were hailed publicly as a “significant step” in resolving the disputes, diplomats were reported to have played down their significance, saying they lack specifics. Liu Zhenmin, China’s assistant minister of foreign affairs said the officials would submit their draft for approval to their ministers. The guidelines, which have been under negotiations for nearly 10 years, spell out ways to implement a declaration of claimant on the need for a code of conduct to govern activities in the area. The ultimate objective is for China and Asean to agree on a legally binding “Regional Code for Conduct in the South China Sea,” but diplomats considered this goal a distant dream. This brings us to the question: What purpose did the intervention of Philippine congressmen, through their visit to the Spratlys, serve? On the face of it, it was no more than a flag-waving exercise. The Chinese do not respect such hollow gestures.